”Beer unites”, by AJ Fusco, distills the spirit of Beer is Culture – that beer is the ultimate equalizer, bringing people from all backgrounds together in conversation. It’s the whole globe united, with a Sixpoint brew at the center of it all. We asked AJ a few questions about his inspiration, process, and views on Beer is Culture. Check out his answers below. When I saw Sixpoint’s post I saw it as a great opportunity to both challenge myself artistically and also really think about the way beer plays a role in this world. My inspiration comes from beer’s ability to bring together people, both friends and strangers. Think about it, you’re sitting at a bar enjoying a beer when to your left could be a fireman and to your right could be a brain surgeon. It is at these moments when beer is honest and unpretentious; it doesn’t see salaries, race or religion. The story behind my entry is quite simple really. Over the course of thousands of years, this beverage has been so important in the development of societies and cultures. And now in this modern day, people all over the world enjoy it together. I do not have much as far as formal art training goes. I took a Drawing 101 class in college, but that is the extent of it besides finger painting and crayons in elementary school. Both of my parents are very artistic so I have them to thank for passing on the creative gene to me. Much of what I have done as an artist has been “self taught”, although I like to use that term loosely. So many other artists have inspired me that I feel like it would be very dishonest to say I taught myself. Technology in art has allowed the artist to do so much more than a pen and pencil could ever do. I myself tend to steer away from the digital world of art because I find much more satisfaction in the brush touching the paper but that is not to say I don’t see technology’s value to the modern artist. Whether a piece is done on a computer or on watercolor paper, there is still a creative mind behind it. The ability to think of an idea and create it is something both the digital and conventional art world share. For my entry I used watercolor, ink, and beer. Yes, you read that right, Sixpoint’s Brownstone was used to stain the background and give it that aged look. I then scanned it on to the computer and was able to digitally add the logos giving it that crisp look it needed, pun intended. I have been influenced by so many people over the years it would be impossible to list them all. My parents first and foremost, have always driven me to create. As a kid I was very inspired by the Disney artists, at one point I wanted to be an animator. As I got older artists such as Basil Gogos and Ed Roth came into my world. Today I am heavily influenced and driven by the art of the tattoo. The forefathers of this art form such as Owen Jensen, Milton Zeis and Norman Keith Collins are just some of the artists I draw inspiration from. I am also lucky enough to have friends in the industry who have also encouraged me to get better every time I put my brush to paper. 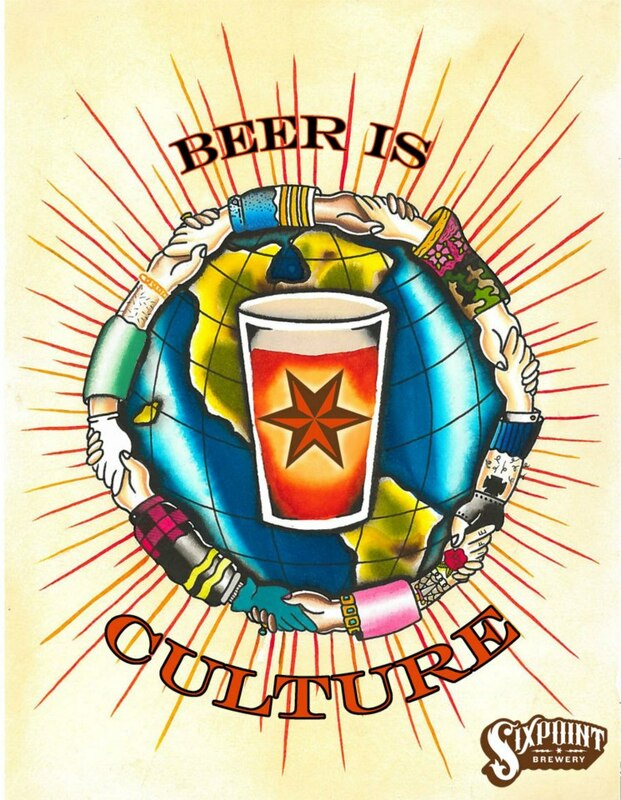 When I hear “Beer is Culture”, I think of how there are so many styles of beer and how there are so many “styles” of people and cultures that continue to enjoy it. From the early periods with recipes painted on walls to tweeting your latest batch, it is a universal language that has no borders or boundaries. Let’s keep it that way.